GENESIS is a fully integrated finite element analysis and design optimization software package, written by leading experts in structural optimization. Analysis is based on the finite element method for static, normal modes, direct and modal frequency analysis, random response analysis, heat transfer, and system buckling calculations. Design is based on the advanced approximation concepts approach to find an optimum design efficiently and reliably. An approximate problem, generated using analysis and sensitivity information, is used for the actual optimization, which is performed by the well-established DOT or BIGDOT optimizers. When the optimum of the approximate problem has been found, a new finite element analysis is performed and the process is repeated until the solution has converged to the optimum. GENESIS is easy to learn, so no special knowledge of optimization technology is required. 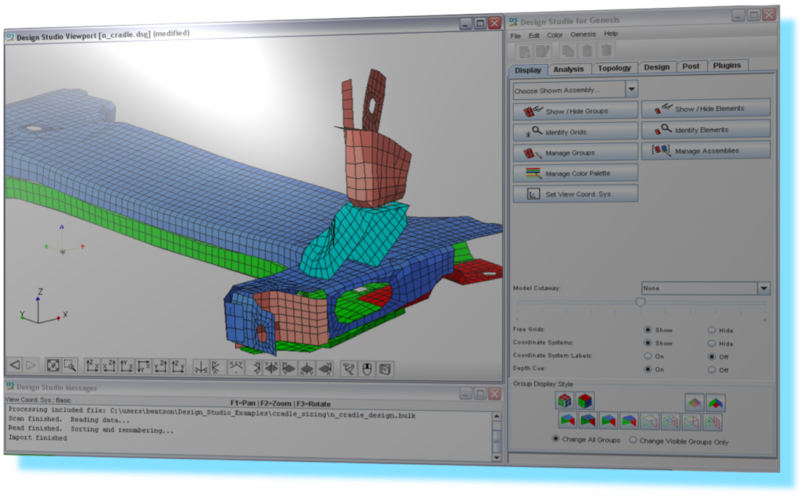 Many design options are available for users including: shape, sizing, topography, topometry and topology. Shape/sizing and topography optimization typically require less than ten detailed finite element analyses, even for large and complex design tasks. The topology and topometry optimization typically takes twenty or less detailed finite element analyses. GENESIS has countless of unique and innovative features that have been developed in house by its developers. It is also the first structural optimization code that was developed from the beginning to be a structural optimization code and it is the first commercial code that fully utilizes second generation approximations pioneered by the company founder Dr. Gary Vanderplaats. GENESIS has introduced new types of optimizations, such us topometry optimization. GENESIS has best in class options for sizing, shape and topology optimization. The internal algorithms help it converge faster than its competitors, which is critical for solving large scale problems. If you are interested to see or test the software, please contact us.